We just learned about the US Territory of Northern Mariana Islands. Another US territory is the island of Puerto Rico, which is just east of Florida in the Atlantic Ocean. 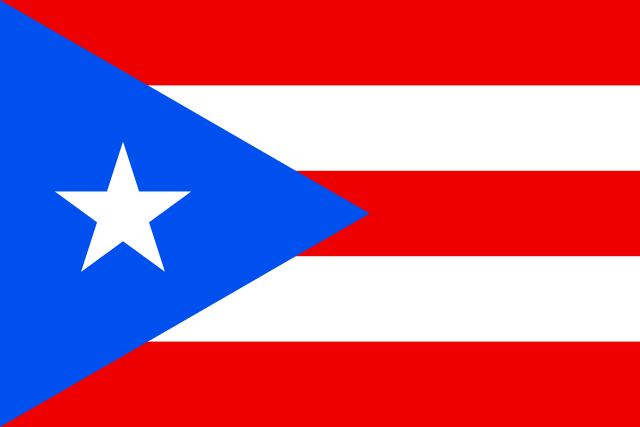 The flag of Puerto Rico has a blue triangle with a star in it, three red stripes and two white stripes. On Flamenco Beach, there are some old rusting tanks that were left there over 30 years ago, and people have painted graffiti on them. There is a fancy old fire station called Parque de Bombas that was designed over 100 years ago to show off at the world's fair. There is a giant telescope called Arecibo Observatory that is over 1000 feet wide.